The Watch serves as the law enforcement of the city. Its make-up is very diverse: some Watchmen are genuinely good people looking to make a difference, while others are on the take for other organizations. There's continuous scrutiny regarding the Watch's capacity for protecting the city’s inhabitants, and it's not that unusual to have citizens complaining to the Council about their competence. Many of the Watch members are former soldiers of the old militia during the Time of Troubles Conflict, when Phlan's people rose in arms to defend their city. As such, many of the higher ranking individuals are experienced war veterans, while the lower ranks are made up with a mix of new bloods and former militia who didn't see quite as much combat. While sufficient to hold posts and have shifts, the Watch's manpower is not nearly enough to create an adequate investigation force. As such, it's very rare that the Watch has squads of men performing sting operations. Members of The Watch are seen patrolling the streets of Phlan decked out in suits of chain-mail with royal blue trims, sturdy looking club in hand. Their outfit is finished off by a dark blue cloak trailing behind them. During the cold winter, they don a set of warmer, quilted doublets and fur-lined bloaks, boots and gloves in the same colors. Quiet and mysterious, Ayrion rarely speaks. Rather his eyes do the talking and tell you what he's thinking (or what he wants you to think he's thinking). When he does speak, his words are usually well thought out and direct, filled with substance and wisdom. 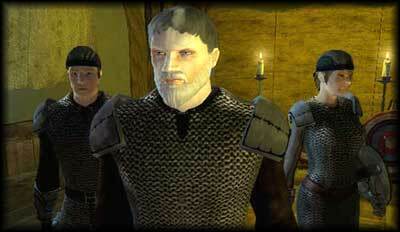 Ayrion Merces was promoted to Oversword when the previous commander, Ivior Cherkov, has fallen in a city siege. He is responsible for the current setup of of the Watch patrols, cpncentrating within Podol Plaza and Old City, with limited patrols over the river and in Western Phlan. Generally, he is a believer in creative punishments. For atrocious criminals, it is simply not enough to jail them and he is a firm believer that ends justify the means. Needless to say, he is willing to be as underhanded as need be in order to maintain order. The Watch is a volunteer force of about 100 men and women that serves as law enforcement for Phlan. Its makeup is as diverse as the population of the city, and the quality and professionalism of their members is also very varied. It can be seen as a mixture of police force and military organization, similar to the French Gendarmerie or the Italian Carabinieri. The history of the Watch is closely tied to the overall history of Phlan since the Watch used to serve as the core of the city militia in times of war until 1381. There is a proud tradition kept from better times that is reflected in some external signs such as the coat of arms or some titles that might sound too pompous for their actual tasks in peacetime. On the other hand, there is the fact that the city and with it the Watch has been pummeled time and again by a sequence of wars and invasions. As a result the Watch contains both battle hardened veterans from wars past and new recruits that just see it as a day job, both well intended men who work for the greater good of the city and selfish people who are in it for themselves. How is the Watch seen by the people of Phlan? As a whole, it is not unusual that citizens complain to the Council about their competence. Most candidates running for a position in the Council include, in some shape or form, a promise to “shape up the Watch" in their campaign program. Objectively the Watch does a fairly good job, given their lack of material means and outside support. Phlan is a small city, and the Watch is a small force. Not surprisingly, Watchmen and -women often get a reputation for themselves (deserved or not), and the citizens' daily interaction with individual Watch members is more frequently dictated by each individual's reputation than the image of the Watch as a whole. How is the Watch organized? The Watch is small enough to be easily manageable as a single unit by one commander and a small staff of trusted subordinates without the need of a deep formal hierarchy or divisions in smaller, separate units. The Watch is led by the Oversword of the Watch. This is an example of a title that reminds of the military roots of the Watch but which hardly fits its current roles, which could be better described as those of a city's sheriff or chief of police. Still, the Oversword has command over all the Watchmen. Directly under the Oversword there are a number of Officers with no specific hierarchy, who bear titles reflecting their main duties, such as “Gatekeeper of Phlan","Day Watch Commander", “Harbormaster" or “Head of Janitorial Services". They are officially referred to by their title or simply as “Officer". Their specific tasks are assigned with their title, along with resources (both material and manpower) they can manage as necessary. These resources may be expanded when needed, but just as easily they may be taken away temporarily to cover other needs. Typically only Watchmen of proven skill are promoted to these positions, which are often related to their prior experience. They can be compared to project managers in a corporation or ministers in a government, in the sense that there is no explicit hierarchy among them, but there is a de facto pecking order that comes from their very different responsibilities and powers. Low level members of the Watch are officially referred to as “Watchman" or "Watchwoman", although they're often addressed by more informal names, such as “Guard", “Private", “Filth", “Scum" and “You", depending on the circumstances, the social status of the speaker and who has the biggest weapon. Their tasks cover everything from watching that the walls don't collapse to patrolling the areas around the city to arresting and punishing criminals to investigating plots against the city. While tasks tend to be naturally assigned to the Watchmen better suited for them this is largely dependant on the Officer in charge and the greater needs of the city. All in all, the Watchmen are a pool of people that are assigned and reassigned to different task forces as required, not unlike policemen from one district are sometimes sent to reinforce another when a large event takes place there, or when Vice detectives are attached to a Homicide unit to investigate a murderous drug cartel. What powers does the Watch have? In the case of the vast majority of the time, they have the powers of a policeman and a judge, with some limitations. Most minor crimes will be dealt with directly by the arresting Watchman, more serious crimes will be handled by special judges appointed by the Council. There is a degree of discretion determining how serious a particular crime is, which is source of no little grinding inside the Watch and between the Watch and individual Councilors that may consider the Watch too lenient or too harsh. The Laws of Phlan are to be learned and internalized by all currently serving Watchmen and copies of the law code are kept at the various stations at all times. Since the Oversword is a public servant that ultimately responds to the Council, which in turn is an elected political body that responds to the citizens (and the Prince), he is forced to make political decisions in his daily work. In particular, he may be inclined to make hasty decisions to calm the population when a perceived or real threat is present, and he is forced to rein in (or cover up) any displays of behavior that may be seen unfavorably by the majority of the citizens of Phlan. Is it possible to play a character in the Watch? No. We did all this just to make you suffer. No, seriously, is it possible? Of course it is possible. Players who want to play a Watchman should approach a DM. Given their powers, special attention will be paid to the maturity of the applicant and his or her ability to simply play the part without trying to act as a mini-DM. Watchmen are just like any other character, and their players aren't special or “better" than the others. If anything, they will be under more scrutiny than any other. Player characters join the Watch at the lowest rung of the organization. While in theory you could play a Watchman as just the guy who goes to work at dawn and tries not to get killed in time for dinner, we expect player characters in the Watch to stand out from the unnamed troop. That's not to say your character has to be successful as a Watchman, or even try to be. What you need to do is to have fun playing your character and make other players have fun. So you can be promoted and boss people around? Characters that distinguish themselves through their service (or who fake it well enough) will start getting more responsibilities and may eventually be promoted and become Officers. If that happens, their tasks and powers will be likely the reflection of their past deeds and reputation. These tasks and powers, and the titles that come with them may grow as a result of their subsequent behavior as Officers. With time and effort, even the position of Oversword is a possibility. Also, quite a few Councilors in the past were former Watchmen that gained popularity and prestige during their years of service and who later used that as leverage for their political careers. Conversely, powers may be reduced, demotions may happen and some Watchmen may even be dismissed from the Watch, even dishonorably, as a result of their actions. Sometimes these twists and turns of fortune are not entirely on the hands of the character, nor are they necessarily completely tied to the job. Make the wrong enemy, choose the right friends, and your job performance might not be the main factor on your next career move. This will of course depend on how high on the Watch your character is. As a basic grunt, doing your work well (or making your bosses think you do) will make your career progress, and even if you make enemies it is unlikely that you will stand out as a specific threat. As you climb the ladder, the more likely it is you will be forced to take sides or walk the political tightrope and mistakes or successes (intentional or accidental) will have more weight on your advancement.